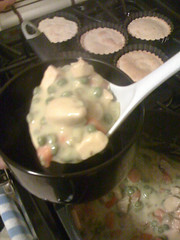 One of my favorite comfort foods is chicken pot-pie, and I've been working out a good filling recipe, but find myself lazy when it comes to making the crust. This "bowl-pie" is a variation on the assembly of a standard pot-pie that is good for the lazy or the hurried... it takes about an hour to prepare. (Time: 0:00) Heat a tablespoon of cooking oil on medium-high in a 4-quart pot. Dice the chicken into about 0.75-inch pieces, and toss into the hot oil along with the garlic salt and adobo seasoning, stirring frequently. While this is sizzling, take the pie crust out of the fridge and let it warm up on the counter as you continue working on the filling base. (Time: 0:15) When the chicken is mostly cooked through, add 1 cup of water, the bay leaf and the cumin. Cover and slowly bring to a boil. (You want to keep all the yummy evaporating juices in the pot to make a broth.) If your oven takes more than 10 minutes to pre-heat to 450°F, you might want to start it now. 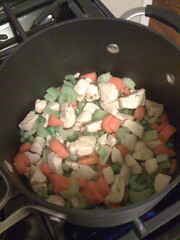 As you're waiting for the water to boil, chop the carrots and celery, then add them to the pot. (Time: 0:20) Once the pot comes to a boil (with all the veggies added), reduce heat to medium, cover and simmer until the carrots are tender, or about 5-10 minutes, while you prepare the crust. 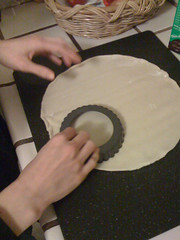 and use the pastry tins to cut pieces of dough roughly the size of the bottom of the pastry tins. ... and stick them into the fridge so they can rest and cool down. While they're resting (about 10 minutes works best, but they're flexible), pre-heat the oven to 450°F. 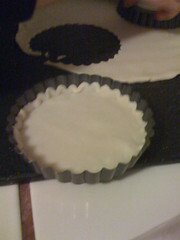 When the oven is ready, take the tart tins out of the fridge and slide them onto the middle rack in the oven. Bake for about 10 minutes until golden brown. 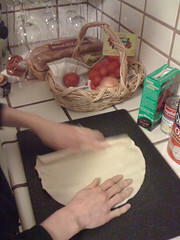 (Time: 0:41) While the crusts are baking, it's time to put the finishing touches on the filling. Take the lid off and let the condensation drip back into the pot of boiling soup. Dig out the bay leaf and throw it away. 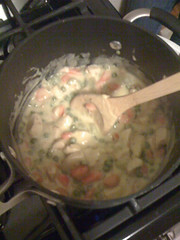 Add the condensed cream of chicken soup, and stir vigorously until the soup is fully incorporated. Put the cover back on the pot, and bring back to a very light boil. (Time: 0:45) When the filling returns to a boil, stir, reduce heat to low, and let simmer until you're ready to serve it. (Time: 0:50) Take the crusts out of the oven and let them cool for 5 minutes. (Time: 0:55) Spoon some filling into a bowl that's conveniently slightly larger than the tart pans. Put one of the crusts on top and enjoy your Chicken Bowl Pie! 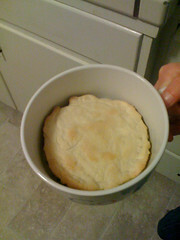 Better than premade pie crust: roll out a flaky biscuit or use puff pastry. 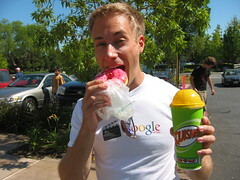 OMG yum!! I def need to try this!